LuJoSoft DeskLock is an easy in use and compact tool for quick computer locking when you leave it unattended. 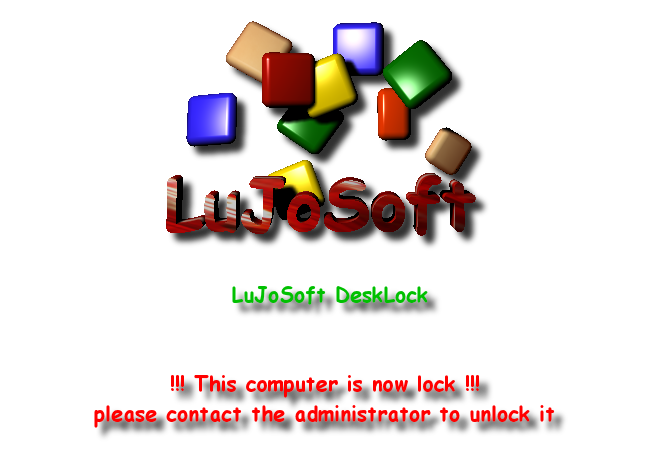 LuJoSoft DeskLock shows a lock screen, disables any user from accessing your pc. You can lock your PC by double clicking on DesktopLock.exe. To unlock the computer you must enter correct password only. Unlike another similar computer lock software LuJoSoft DeskLock won't be affect Ctrl+Alt+Del or a system reset. * Quick and safe computer lock. * You have 3 tries to enter password then the intruder will be lockdown. * Protected against Ctrl+Alt+Del or a system reset. * Protected against force closing using "Alt F4". * You can change your passsword at any time. * All process will continue to work will the screen is lock. * LuJoSoft DeskLock will protect your computer even after incorrect shutdown e.g. when anybody turn off the power of locked computer. * it's absoutly Free!!! No catch, no nag screen or cripple function. * Simply specify your password and the program is ready to use. You may lock your computer by double clicking on the LuJoSoft DeskLock icon o the desktop. To unlock, press any button on your mouse and type your password. * Remember the combination key to be use to unlock after incorrect password lockdown. * If ever you forgot the combination of key you can contact me from the contact page at LuJoSoft and I will assist you. Qweas is providing links to LuJoSoft DeskLock 1.1.0.20 as a courtesy, and makes no representations regarding LuJoSoft DeskLock or any other applications or any information related thereto. Any questions, complaints or claims regarding this application LuJoSoft DeskLock 1.1.0.20 must be directed to the appropriate software vendor. You may click the publisher link of LuJoSoft DeskLock on the top of this page to get more details about the vendor.